1810 Cocina Regional specializes in traditional, regional Argentine food. 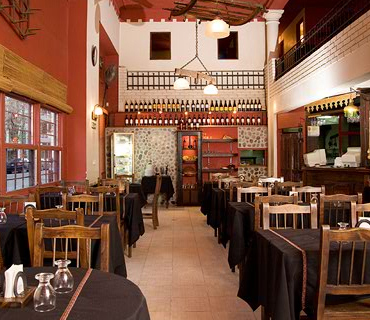 Eating here is almost like having a home-cooked Argentine meal. Empanadas are a house specialty. If you’ve never tried an empanada, it’s a pastry stuffed with a savory filling. The most popular fillings are ground meat (carne), ham and cheese (jamón y queso) and ground corn and sweet red peppers (humita). Warning: They are addictive. My favorite dish on the menu at 1810, and the reason I will come back, is the lentils with bacon and sweet potatoes. If there is a better food combination than lentils and bacon I have yet to discover it. The atmosphere is simple and homey. Prices are moderate. If you go to the Palermo location, note that the restaurant’s doors slide open. I thought the door was locked until a waiter came to my rescue and let me in. It was a little embarrassing. The Palermo location is at Julián Álvarez 1998. There are also locations in Belgano and Microcentro. Here’s a link to the 1810 website. Why did you have to post this, now I will no longer have the place to myself. Seriously, this is GOOD food at an excellent price. I would have no hessitation in recomending it.